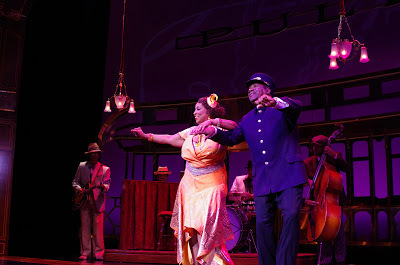 Pullman Porter Blues was written by Cheryl L. West, directed by Lisa Peterson, and is a co-production with Seattle Repertory Theatre. The production makes its way to Arena Stage after opening at the Seattle Repertory Theatre. This has got to be my favorite production so far this season at Arena Stage. The set was done creatively and the acting was superb, with a mix of comedy and drama. Pullman Porter Blues takes place in June 1937 on the Panama Limited, a sleeper train operated by the Pullman Palace Car Company that ran from Chicago to New Orleans. It profiles the lives of the Sykes family, three generations of African American porters who are working on the same train. Porters were one of the first professional positions available for African Americans and eventually a porter union was formed called the Brotherhood of Sleeping Car Porters, whose formation is featured in the production. However, E. Faye Butler, an Arena Stage favorite, steals the show as Sister Juba, a boisterous lounge performer on the train who also has a drinking problem and is the former love interest of one of the Sykes porters. This show will make you laugh, but it will also make you think, especially about what porters had to go through every day in order to do their jobs. Pullman Porter Blues runs from November 23 to January 6 in the Kreeger Theater. Southwest Night will be on December 26 at 12pm where ticket prices are discounted at $35 for those who live or work in Southwest (normal prices range from $64 - $109).